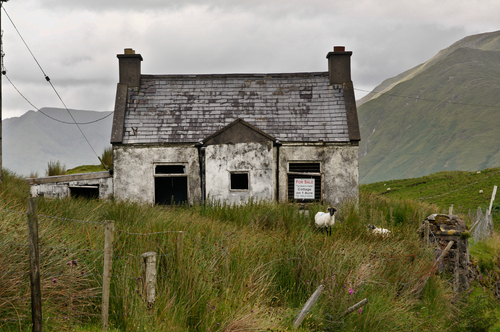 We came across this "lovely" Irish cottage located in Connemara, Ireland, surrounded by the majestic Maunturk Mountains. According to the sign it is fit for royalty: "For Sale. The Queen's Castle. Cottage on 1 Acre". Note that it is fully air conditioned and humidified (broken windows) and has electrical service. The sheep are not included. The compelling surroundings do make it a serious consideration.